In the era of globalization, FDI plays an important role as it intensifies the interaction among the countries, regions, and firms. FDI is playing a crucial role in improving the infrastructural facilities of countries and enhancing economic situation especially in the developing countries. Another important aspect of FDI is it increases employment in domestic economies, which in turn reduces the poverty level and also promotes the competition in domestic markets. With these activities, the government earns more revenue, which can be used for developmental activities. In this context, the chapter makes an attempt to identify the determining factors of FDI inflows into developing economies by selecting nine developing countries for the time period 2000-2015. Due to the different characteristics of each of these countries, there is a lot of heterogeneity in the data. To reduce the heterogeneity among the selected economies, the authors propose employing a panel data approach to identify the factors that influence the FDI inflows. In the era of globalization, Foreign Direct Investment (FDI) has witnessed tremendous increase across the countries in the world. Now, FDI is an integral part of an open and effective international economic system and a major catalyst to economic development. These FDI flows are most important to the developing economies in achieving their growth and development as these countries do not have enough national savings to finance their investments. Initially they borrowed the loans from international agencies and during the 1980’s the lending of commercial banks decreased due to debt crises, forced many countries to reform their investment policies so as to attract more stable forms of foreign direct investments. Developing countries, emerging economies and countries in transition have come increasingly to see FDI as a source of economic development. They believe that in addition to foreign capital, FDI brings with it employment, managerial skills and technology and therefore it accelerates growth and development. The role of FDI as a source of capital has become increasingly important in the modernization, income growth and employment of these developing economies and hence, they have liberalized their FDI regimes. There has been a long debate over issue of the role of FDI’s and economic development of a country. It is widely believed that FDI provides a stronger stimulus to economic growth in host countries than other types of capital inflows. The underlying argument is that FDI is more than just capital, as it offers access to internationally available technologies and management knowhow (The Economist, 2001). However, Townsend (2003) observed that there is no clear evidence of the relationship between foreign direct investment and economic growth. Lall (2002) concluded that the contribution of FDI to economic growth depends on many factors and it varies over time and from one host country to another. Some see FDI as a very important tool for economic growth especially in the less developed countries (LDCs) but some scholars claimed that the contribution of FDI to economic development is not as pronounced as most people believe. It is well known that countries which offer profitable investment opportunities in the global competition can attract capital. Indeed, most of foreign direct investment (FDI) in world took place among the developed economies. However, in recent times capital flows to developing countries is also increasing. Developing countries from Asia, Africa and Latin America are successful in opening up their economies to FDI flows by implementing the liberalized policies. Most countries are creating favorable environment to attract more FDI inflows in modern managerial, production and marketing technologies which are necessary for development of an economy. Foreign investors seeking rates of return on their funds may be attracted to invest in developing countries with low capital stock and hence a high marginal productivity rate of capital provided that investment in those economies is not viewed to be too risky. Also, the availability of human capital at lower cost is another attracting feature of the investments. Investment in developing countries can take place through three main financial channels: Loans, equity investment and FDI. Among these the least desirable form of capital flows is debt financing (loans) as debt- financed activities may produce insufficient returns to cover the debt service payments (i.e. interest). If we consider equity financing like portfolio investment can be destabilizing factor, especially in countries with emerging financial sectors. Moreover, they are very volatile in nature. Given these conditions, FDI is most likely form of capital flows to exhibit long term investment intentions due to large fixed costs of setting up and dismantling subsidiaries for multinational enterprises. 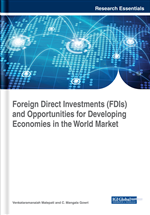 FDI is important for any developing country because it facilitates the transfer of technology, increase employment in the domestic economy, reduces poverty, and strengthens the links with international markets. It also promotes competition in the domestic market, contributes to human capital development through employee training, and to maximize corporate tax revenues. It is useful in bridging the gap between domestic savings and investments.